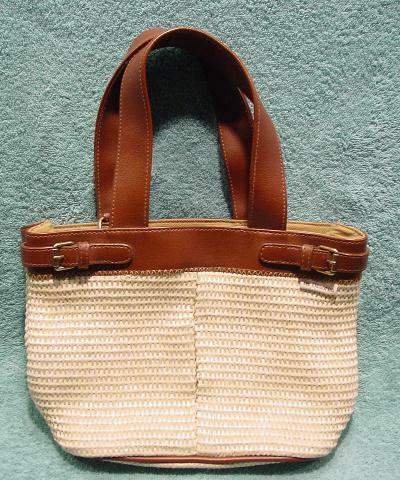 This 65% olefin, 28% cotton, and 7% polyester purse is by Liz Claiborne. 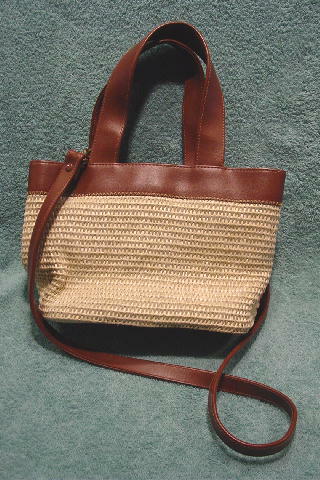 It has a brown PVC trim, 14 1/2" long handles, and 39 1/2" long detachable shoulder strap. The interior has a center zippered section, 2 large open sections (one on each side), and an interior back zippered compartment. The lining is in a light cocoa and it has an interior magnetic snap closure. The 2 front sides open a bit to reveal the same fabric. The surface is in a creamy antique white.